Especially on cold days I’m always in the mood for comfort food. One of my favorite meals is definitely curry. 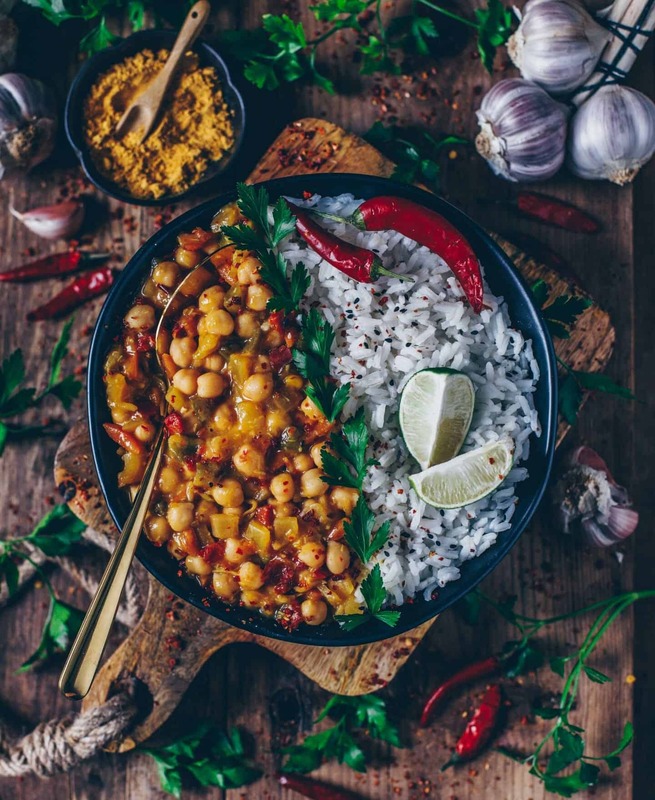 This delicious and nourishing Indian Chickpea Curry is vegan and gluten-free and you can make it with just a few ingredients in less steps. I love adding indian spices because they’re not only delicious, but also healthy and warming. Another important ingredient is coconut milk due to it‘s creamy texture and yummy taste. Moreover coconut milk is rich in healthy nutrients and fats which satisfy your body and soul. I’ve also added a little bit of coconut blossom sugar because I like a little sweetness to spices and finished off the curry with a big squeeze of fresh lime juice. 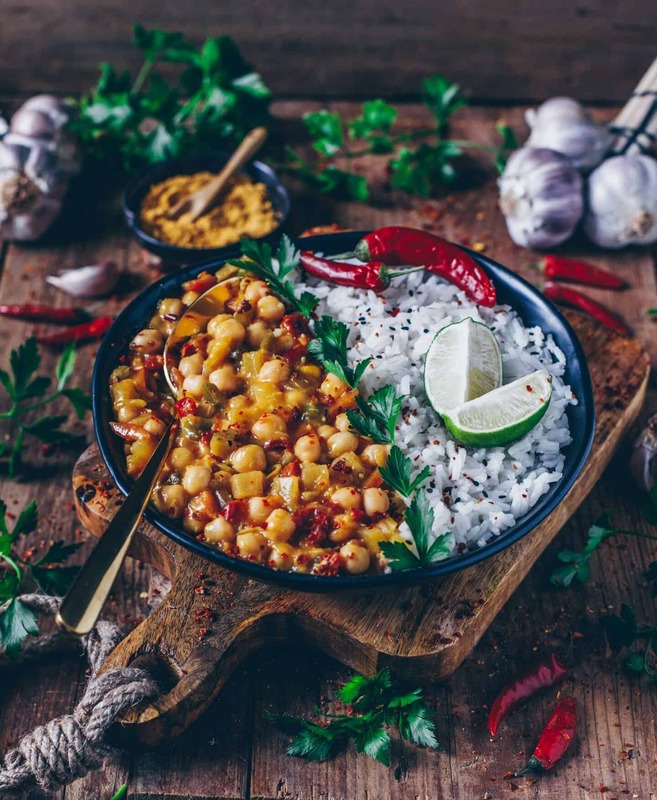 Here you can also check out the recipe of my ‘Red Chickpea Coconut Curry‘ which is very delicious as well. If you cook a larger amount of curry, so that you‘ll have leftovers, don’t worry, because it tastes even better the next day. Moreover you can serve this meal at potlucks and take it to work or university with you. Or you can easily freeze it for another day when you’re busy or too lazy to cook. Thanks to the infused curry flavors, it’s a dish that‘ll definitely warm you up on cold and cozy days. 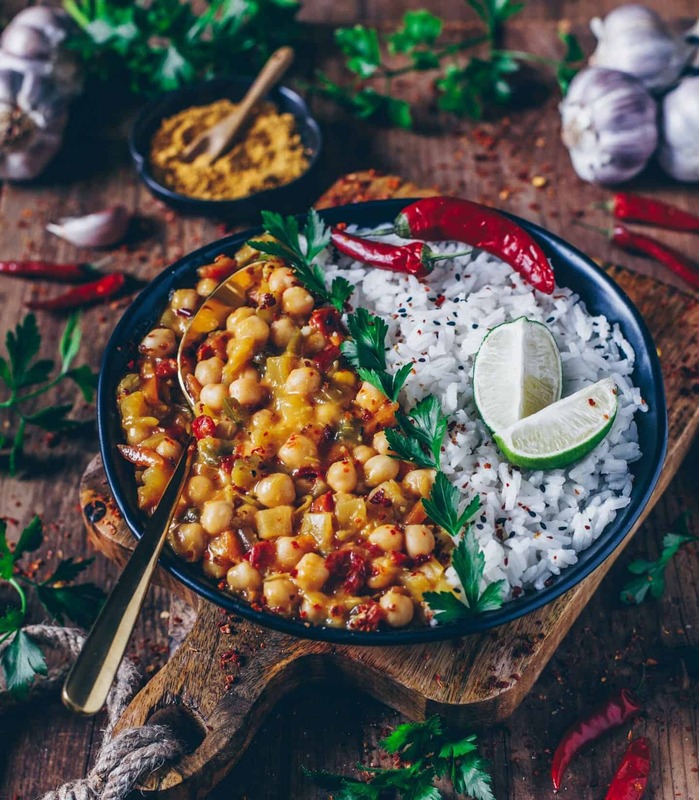 When you buy the yellow curry paste or the other seasonings, you should check the ingredient list as I always do, so you can make sure that the one you use has no artificial flavors or additives and that the ingredients originate from a biological cultivation. You can serve this curry with rice, potatoes, quinoa, flat bread or just plain, however you like. Wash and core red bell pepper. Peel carrot, onion, ginger & garlic. Then cut the vegetables into cubes. Heat up coconut oil in a pan and sauté onion, garlic and ginger for about 1-2 minutes. Add curry paste and the remaining seasonings and roast for about 1 more minute while stirring. Then add sliced courgette, red bell pepper and carrots and fry for a short time. Whipe off with coconut milk. Add chickpeas and coconut blossom sugar to desired taste. Bring to the boil and let the curry simmer for about 8-10 minutes at low heat until the vegetables are soft and desired consistency. Add some water or vegetable broth if needed. Finally season again to taste. Serve your curry with a squeeze of fresh lime juice, to rice (or other side dishes of choice). Easy to prepare, delicious, nutritious & simply amazing ? Thanks you for the feedback!?? Hi! This recipe looks delicious. Is it okay to use light coconut milk for the curry? Sure, you can also use light coconut milk but I think with full-fat coconut milk it tastes creamier and has more flavor ?